Input tax credit on input, input services and capital goods is the most contentious issue where always are lot of litigation on admissibility . This is common problem in case of lack of clarity of the provisions and rules under the existing indirect tax as well like Excise , Service Tax and VAT. With the subsuming of one tax , in GST we are hopeful that the present problem will mitigate to certain extent . Before going into detail I will like to explain on the relevant definitions of ITC which make the chapter less cumbersome and will facilitate to understand in better way. Definitions and provisions provided in GST on ITC in comparison to existing laws are more simpler and understandable. 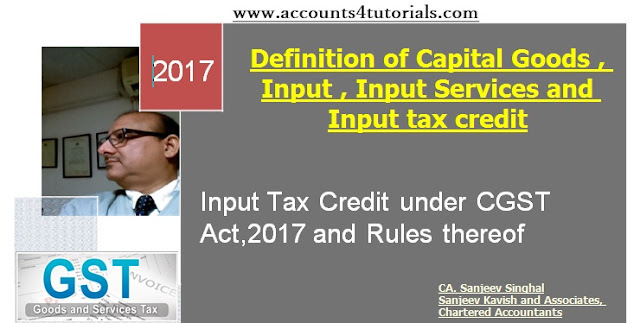 Now, We can go through all definitions related to Input tax Credit under CGST Act,2017 in detail. e) Tax payable under the provision of sub section (3) & (4) of Section 7 of the Union territory goods and service tax Act. Now, we will discuss the Input tax Credit provision one by one along with Rules of Input Tax Credit . Where the goods are received in installment or lots, ITC shall be available at the time receiving of final installment or lot. Same ITC can be claimed after the payment to supplier along with tax payable thereon. Rule -2 provides that such ITC shall be added to output tax liability for the month after the passing of 180 days. Rule 2 says RP need to pay interest as per section 50 of the Act from the date of taking ITC to the date of adding to out put tax liability. Where the RP has claimed depreciation as per Income Tax Act on tax component of cost of capital goods and plant and machinery, ITC shall be denied on the said tax component. ITC shall not be allowed after the due date of furnishing the return u/s 39 for the month of September following the end of financial year to which invoice/ debit note relates or furnishing of the annual return which ever is earlier . A] where the goods and services are used partly for business or partly for personal purpose by RP , the amount of credit shall be limited to ITC pertain to used for business. C] Exempted supply under Point-B as explained in Sec. 2(47) and shall include supplies on which recipient is liable to pay tax under reverse charge basis, transaction in securities, sale of land, subject to clause b of paragraph 5 of schedule-II, sale of building. imparting training on driving , flying ,navigating such vehicle or conveyance. Food and beverage, outdoor catering , beauty treatment, health services, cosmetic and plastic surgery, except when such inward supply of goods and services is used for output taxable supply of the same category of goods and services. Travel benefit extended to employee on vocation such as leave or home travel concession. F] work contract service or both when supplied for construction of immovable property other than plant and machinery except when such input services used for further supply of work contract service. G] goods or services used by RP for construction of immovable property ( other than plant and machinery) on his own a/c, even when used in course or furtherance of business. For the purpose of clause F and G, the construction includes reconstruction, renovation, alteration, addition, repair to extent of capitalization to the said immovable property. H] goods and services on which tax has been paid u/s 10. J] goods lost, stolen, destroyed, written off, disposed off by way of gift or free samples. K] goods and services or both received by non resident taxable person except import of goods. L] any tax paid u/s 74,129 and 130. 3] pipelines laid outside the factory premises. Person who has applied for registration and granted the same , will be entitle to claim ITC on input, semi finished and finished goods held on immediately proceeding the day on which he is liable to pay tax. Person who take registration under sec. 25  , will be entitle to claim ITC on input, semi finished and finished goods on immediately proceeding the date of grant of registration. Where an exempt supply of goods and services by RP becomes taxable, will be entitle to claim ITC on input, semi finished and finished goods and capital goods on immediately proceeding the day on which he is liable to pay tax. Provided that credit on capital goods shall be reduced by percentage point. RP can not claim input tax credit under the above said sub sections after the expiry of one year from the date of invoice. Where there is change in the constitution of RP on account of sale, merger, demerger, amalgamation , lease or transfer of the business with transfer of liabilities , in such cases RP shall be allowed to transfer the unutilized input to the sale, merger, demerger, amalgamation , lease or transferred business. Apply- GST ITC-02 online with request to transfer the unutilised ITC to transferee. In case of demerger , ITC shall be transfer in proportion of fixed assets as per the demerger scheme. Transferor shall submit certificate from CA or Cost accountant that business transfer is done with liabilities. RP if switches to section- 10 for composite scheme or, where his goods or services become exempt, shall pay an amount by debit to electronic credit ledger or cash ledger, equivalent to input tax on stock and capital goods , reduced by percentage point, immediately proceeding the day of switching over and exemption of goods. [ Rule -9 (b) says remaining life of capital goods will be ascertained in months and ITC shall be reversed on pro-rata basis for the residual months ] and for input on stock , ITC shall be calculated on proportionate basis on the basis of invoice on which the credit was availed. The said reversal shall be calculated separately for CGST and IGST. The amount determined above shall be furnish in GST ITC -03. In case of disposal of capital goods , RP shall pay an equal amount of input as reduced by percentage point or on transaction value of such capital goods which ever is higher. But in case of refractory bricks , tools , jigs mould and dies and fixture are supplied as scrap, tax shall be paid on transaction value. Rule – 5 -furnish GST ITC-1 where ever input on stock is taken within 30 days from the date of eligibility of ITC. Claim of declaration shall be certified by chartered accountant/ cost accountants if the ITC is exceeding Rs. 2 lacs. Principal as referred in Sec. 143 , shall take the credit of input sent for job work provided the input after job work has been received back within one year from the date of sent out. ITC can be claimed even if the goods directly sent to job worker. One year shall be computed from the date of receipt of material by Job worker. If the goods have not been returned within the stipulated period, the same shall be treated as supply to job worker from the date of goods sent out. [ Rule -10 the input or capital goods shall be sent on challan as per the information contained in Rule -8 of Invoice Rules. The detail of challan shall be furnish in GSTR—1 for the period. Principal shall be entitled to take credit of ITC on capital goods sent to job worker. Credit shall be valid if such goods have been received back within three years of being sent out. ITC can be taken even if the capital goods directly received by job worker. If the capital goods have not been returned within the stipulated period the same shall be treated as supply to job worker from the date of capital goods sent out. The aforesaid period of one year or three year shall not be applied in case of moulds, dies, jigs and fixture, or tools sent out to job worker for job work. IGST shall be distributed as IGST to every recipient - Rule 4[e]. Input tax credit of Central and State tax shall be distributed as follows: -Rule 4[f]. a] if recipient is located at same state where ISD, Central and State tax shall be distributed as it is. b] In case of different state, ITC shall be distributed as IGST. III. ITC can be distributed only to that recipient eligible. IV. shall be distributed to attributable recipient . If more than one recipient , it shall be on pro rata basis on the turnover of the state or Union territory of the relevant period. Recipient should be operational in that relevant period. a] the recipients of credit have turnover in the state or union territory in the financial year proceeding the year in which credit to be distributed. b] if some or all of the recipients of credit have not any turnover in the state or union territory in the financial year proceeding the year in which credit to be distributed. Last quarter preceding the month in which credit to be distributed shall be the period. Where the ISD distribute any credit resulting in excess distribution, the same shall be recovered from such recipient along with interest, and the provision of sec. 73 or 74 [ demand and recovery ] shall apply for such recovery. A. Yes. The definition of input tax include tax payable under Sec. 9(3)& (4) which is reverse charge. The credit can be availed if such goods and services are used or intended to be used in the course or furtherance of business. A.Yes . In terms of definition 2, 2 and 2 . It may be noted that ITC on capital goods is permitted in one installment except land ,building or civil structure ,pipeline outside factory premises and telephone tower. Q.Where goods and services receive by taxable person are used for both taxable and non taxable supplies, weather the input tax is available. A.In this case ITC shall be restricted to taxable supply as per sec. 17. Q.Is the ITC is available in case of change of constitution like sale, merger, demerger, amalgamation etc. A.Yes , it is available as per Sec. 18 in the manner as prescribed. Q. A dealer paying tax under compounding scheme and crosses the threshold limit, can he get ITC and from which date. A. As per Sec. 18[c] , he can avail the credit on input and input contained in semi finished goods and finished goods on the date immediately proceeding the date from which he becomes liable to pay tax. Q.Weather the principal is eligible to take input on input sent to job worker? A.Yes. As prescribed in sec. 19.